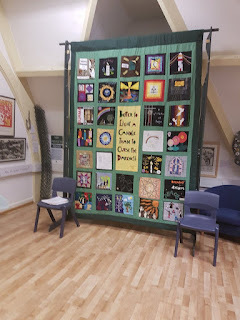 In January 2011 York Amnesty International group had the idea to mark the 50th anniversary year of the organisation by making a community quilt (see below for more information about the evolution of the quilt). We were delighted by the response! Thirty local groups worked on squares between February and September 2011 producing a mosaic of inventive, colourful and inspiring designs. These were then made into a quilt by York Amnesty with help gratefully received from some of the contributing groups. The final stitch was placed just in time for the quilt’s unveiling at York Minster in December 2011. Many of those who took part told us how much they had enjoyed the project, how it had brought people together or provided a means of remembering others. With its myriad of colourful designs and standing at over nine feet tall, we think this beautiful collaborative creation is a fitting celebration of the work of Amnesty International, and we look forward to displaying it many times. Yorkshire on a five year loan.